The project is designed to help poultry experts to develop diagnostic technologies that can be transferred from the Faculty into Indonesian laboratories and receives funding from the Australia-Indonesia Institute of the Department of Foreign Affairs and Trade. Professor Glenn Browning delivers a seminar on poultry disease management and diagnostic technology at Universitas Gadjah Mada. 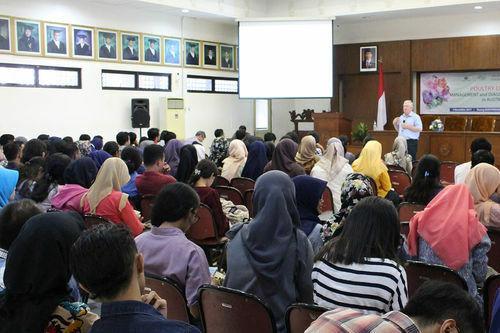 The visit began with a seminar on poultry disease management and diagnostic technology in Australia at Universitas Gadjah Mada’s Faculty of Veterinary Medicine (FVM) in Yogyakarta, Indonesia. Around 100 researchers, undergraduate and postgraduate students attended. 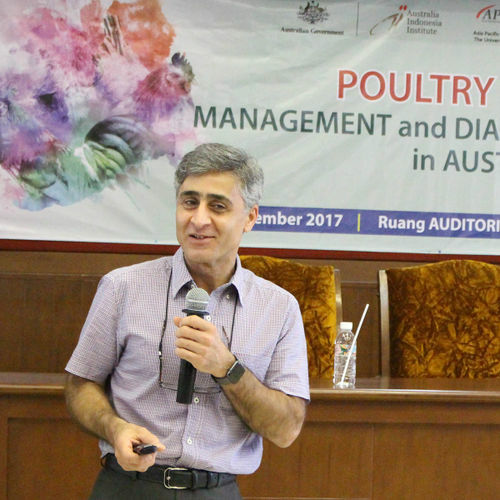 Professors Browning and Noormohammadi also spoke at a roundtable discussion on the transfer of diagnostic technologies for significant diseases of poultry at the FVM. Other speakers were Dr Ayatullah Natsir of PT CEVA Indonesia, Dr Hendra Wibawa of Balai Besar Veteriner (BBVet) Wates research institute and Dr Nurmawati Rasyid of Mulya Satwa Poultry Farm, and attendees included representatives from over 20 poultry farms and researchers from the FVM, Universitas Hassanudin and BBVet Wates. The academics also lead a workshop at FGM covering extraction of genetic material and techniques for interpretation and analysis, and completed the exchange with visits to the BBVet Wates research institute and a commercial poultry farm. The next stage of the project will see Universitas Gadjah Mada veterinary staff visit Melbourne for training workshops ahead of the implementation of new diagnostic technologies in Indonesia in late 2018-19. Banner image: The Universitas Gadjah Mada Central Building in Bulaksumur campus, Yogyakarta, Indonesia.